Choosing yarn for test knit #3 didn’t go as planned. This is the combo I decided to use. First, I wound the yarn on the right. 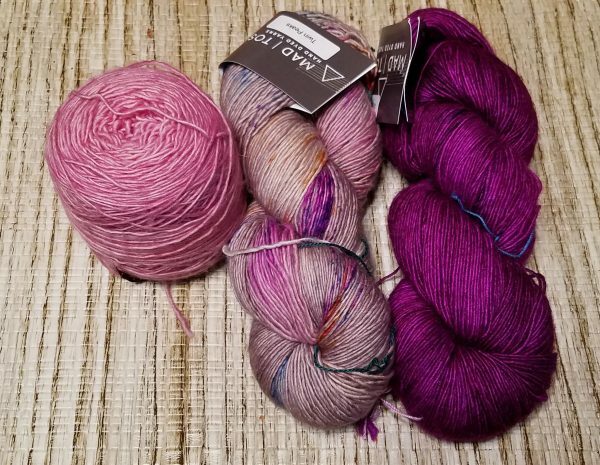 I thought all three were Tosh Merino Light (Madelinetosh) but when Is tarted winding the purple yarn, I said “this doesn’t feel like TML” and it wasn’t. It’s Eyre Light. TML is 100% wool where Eyre Light is wool, silk and alpaca. I wouldn’t mind mixing the two but I don’t want Eyre Light for the bobbles and that’s what it would have been used to make. So, I got online and ordered Wino Forever (the purple) in TML. Then I started putting the yarn in my project page and realized Twin Peaks (the middle color) didn’t come from Eat, Sleep, Knit and since I want this project to count for the Q1 KAL, all the yarn had to come for ESK so . . back to square one. This is what I’ll be using. The gold on the right will be the “pop” color. All three were in the stash. All three came from ESK so I can use this project for my Q1 Knit Along. There are some yarns that are known for being tangled and difficult to wind. Madelinetosh has always been easy to wind but that ball on the right — a mess! When I looked at the hank, I thought “this is not going to go well”. Sure enough, about a quarter of the way into it, I had a mess so I took the cake off the winder, wove it in and out of the tangled areas, which was about a quart of the skein, wound it all by hand. Then I looked at what was left on the swift and thought . . I am not winding that whole skein by hand so I cut the yarn that was hand wound, finished winding the rest of the skein onto the winder, tied a knot and re-wound what I had hand wound but about halfway through that, Boots made a flying leap, landed on the yarn that was being wound, caused a huge hiccup so once the whole messy skein was wound, I set it on a spindle and re-wound the whole skein again. I am done winding yarn for a few days . . I hope. The Pink Hooded Sweater – I have one more sleeve to do and that’s mindless knitting. I can do that tonight if we watch a movie or tomorrow if Vince wants to watch the Super Bowl, which is kinda doubtful. Test Knit #3 – I’m going to go ahead and get started on it just to make sure these colors are going to work ok.
Socks for the Flash Knit Along at ESK – The pattern may require more attention so I’ll have to see what happens with it but I can cast those on Monday. I’m kinda hoping that by Friday, all these projects will be finished! I like your choice. Those colors will look great on you! Sorry you are having troubles with the yarn winding. That is so frustrating! !